Sometiems you come across something so delicious that you kind of have an out of body experience. And that’s what these cupcakes do for me. I had them first at my little sister’s wedding last summer. And then my mom made this recipe into a cake for Creamie’s first birthday in January. And I made them this afternoon, and they are HEAVEN! We have the Martha Stewart Show to thank for them. My butter was too soft and as a result my frosting was too soft. (I just used an untipped pastry bag to squirt it onto my cuppiecakes, and then I put them in the fridge to help keep them from melting. Next time I make these I’ll probably strain my frosting puree a little. I think the extra liquid was also a contributor to the soft frosting problem. I topped each cuppiecake with a raspberry. Yummy! 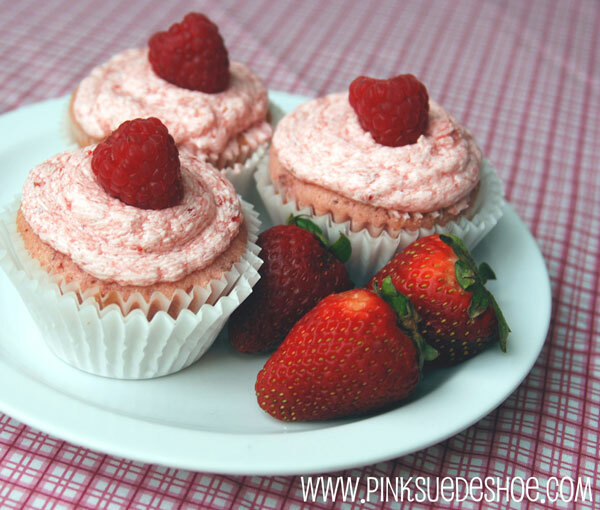 OH my gosh, i have had Martha’s strawberry cupcakes before and they are so delicious! i am so jealous you are eating them right now. I will have to keep that recipe and make them myself! My nieces are coming to visit next week – I think we need to make these. Thanks for the recipe and extra tips! Strawberry bundt cake for dinner….mmmmmmm. Those look absolutely amazing! i’m so making them this week! these look absolutely heavenly!! i will definitely be making these… soon! !